The man who ignited a firebomb and took a hostage at the Cologne central rail station is a 55-year-old Syrian who was granted asylum in 2015, German police confirmed Tuesday. Police did not release the suspect’s name, but said he has been living in refugee housing since arriving in Germany in March 2015. At around 12:45 p.m. local time on Monday, the man entered a McDonald’s near the train station and ignited a gasoline bomb, injuring two people. One of the victims, a 14-year-old girl, is receiving treatment for severe burns. He then fled to a pharmacy at Breslauer Plaza, near the back side of the train station, where he held a worker hostage for two hours. Police say he was carrying multiple gas canisters and could have caused a large explosion. Investigators are still working to determine a motive for the attack and have not ruled out terrorism. Several eyewitnesses said the attacker claimed to belong to the Islamic State, but investigators have not yet found evidence linking him to the group, senior Cologne police official Klaus-Stephan Becker told a news conference, according to Reuters. Before Monday’s attack, the suspect had been investigated for what Becker characterized as “medium-level” crimes, including theft, disturbing the peace and possession of marijuana. Police said he may suffer from psychological problems, citing his criminal history and lack of employment. The suspect’s son and brother also live in Germany. Police have questioned the son and are waiting to talk to the brother, Becker said. 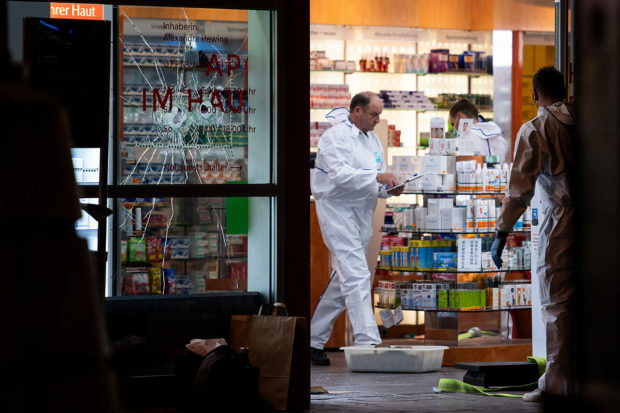 Germany has suffered multiple attempted and successful terrorist attacks in recent years, mostly perpetrated by attackers claiming allegiance to the Islamic State. An ISIS terrorist drove a truck through a Berlin Christmas market in December 2016, killing 12 people. More recently, German police thwarted a potential knife attack on a Berlin half marathon in April when they arrested a suspected Tunisian jihadi in possession of the deadly poison ricin and bomb-making materials. Germany also saw a rise in crime coinciding with the arrival of roughly 1 million migrants in 2015, mostly people from Iraq, Afghanistan and Syria. Cologne, a major destination for many of the migrants, experienced a spate of sexual assaults, notably during the city’s 2015 New Year’s Eve celebration, when hundreds of women were groped and robbed by packs of migrants.